I love when regular things come in small sizes. Dogs, cupcakes, baby shoes, cars. Even as a kid I liked little stuff. When my grandma took me toy shopping for my birthday one year, I picked out miniature boxes of food that were for display in miniature doll houses. I didn't have a miniature doll house. I just grooved on the teeny, tiny food boxes. 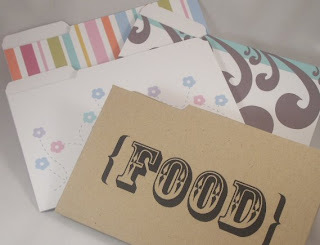 Anyway, when I saw that Paper Source started carrying these Mini File Folders I wanted some. But I wanted them with a little more umpf. So I created my own version. This is the first PDF template set I've created for the shop. I'm really excited about these little guys. I hope they find a place in other people's live who like little stuff. Ooo! Ooo! Ooo! These will be great for little cross-stitch patterns that leap from my sketch pad while I'm pondering problems at the office!! these are HILARIOUS. i'm going to shrink them to keep my business cards in. thank you! They are fantastic, thank you for sharing. I just found these while looking for the tiny ones. Thanks for the pattern. Very nice. I can think of all kinds of uses for these things!